In the last few weeks, I have been sharing the information I have found for Matilda Stewart, and Matilda’s children. (Matilda appears to have been a half-sister of my 2x great grandmother Martha Richardson. Last week, I shared the information I had found for her son Donald. Since the next child, John, died at the age of 14 years, I will share the information I have found for her next child, Andrew, in this post. Maude Ann born in 1874 at West Melbourne. Charles Patrick born in 1875 at Hotham. Charles died in 1922 at Cheltenham. Margaret born in 1878 at Melbourne. Margaret died in 1920 at Heidelberg. Her surname at the time of her death was Moonie. Martha born in 1884 at Melbourne. Martha died in 1923 at Melbourne East. Her surname at the time of her death was Chalmers. I wasn’t able to find the deaths of Maude, Isabella or Francis using the father’s name Andrew Gordon and the mother’s name Bridget, so I decided to get Andrew’s will. I had previously found that Andrew had died in 1903 in Balwyn. Bella Gordon, Charles Gordon, Martha Gordon, Margaret Mooney, and Maud Stewart, all of Balwyn in Victoria. The statement listing the children was made on 3 October 1907. Maude Anne Stewart died in 1913 at Fitz S, aged 67. Her parents were listed as Gordon Andw and Bridt (Donnelly). Margt Gordon married Geo Moonie in 1906 (registration no. 5675). Francis hadn’t been mentioned in Andrew’s will, so I decided to see if I could find a death for him between 1886 and 1903. I found a death entry for a Frances Gordon in 1886 at West Melbourne. His age was listed as 10. I still wasn’t able to find a death entry for Isabella, so I again turned to Ancestry, which had a Public Member Tree that showed that Isabella married Albert John Vickers in 1908, and died in 1939. I was able to find a death entry for an Isabelle Vickers in 1939, aged 50, but her parents were listed as William Gordon and Fanny. I therefore decided to try to see what happened to Isabella by following the family in the Electoral rolls, starting with the 1903 Electoral roll, and with the family living in Balwyn. I decided to search for Bridget first, because she had a less common given name than the children. The 1906 Electoral roll shows the same information, except Cecile Morgan Gordon is no longer there. Bridget died in 1913, so I then searched for Charles Patrick. The 1913 Electoral rolls show Charles was still at Maling Rd Canterbury. Bridget was still there, listed at Daphne st. Canterbury. In 1914, Charles Patrick Gordon was living at Canterbury rd., Surrey Hills. Isabella Gordon was also listed – c/o Mrs Moonie, Canterbury rd., Surrey Hills. Charles Patrick Gordon died in 1922 – the Electoral roll closest to that date was 1919. This shows that Charles Patrick Gordon and Isabella Gordon were living at 3 Northcote av. Canterbury. Since Isabella was still listed under her maiden name Gordon in 1919, this meant that the Isabelle Gordon who married Albert Vickers in 1908 was unlikely to be the same person. Most of Isabella’s family died around the same time: her mother died in 1913, and so did her sister Maude. Her sister Margaret had died in 1920, her brother Charles died in 1922, and Martha died in 1923. Since her siblings all died within a few years, I thought I might try their husbands, to see if Isabella was with one of them. The last electoral roll I could find Leslie Chalmers on was 1919 – he died in 1921. George Moonie last appears in 1922, living at 3 Northcote av. Canterbury. I found Charles Patrick Gordon on this electoral roll as well, living at 48 Maling rd. Isabella wasn’t there. Charles Stewart lived the longest, but I wasn’t able to find Isabella Gordon living with him in the few years I looked at. I then narrowed the search on Ancestry to birth, death and marriage records and found the birth entry for a John Rupert Kennedy in 1880 in Young, New South Wales (reg.no. 27907). His parents were Robert John Kennedy and Rose Ann. 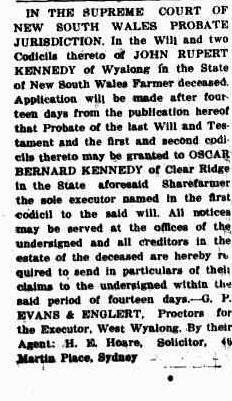 In the above notice, probate was granted to Oscar Bernard Kennedy, so I searched for Oscar’s birth entry and found he was born in 1883 in Young, New South Wales, and was the son of Robert J. Kennedy and Rosanna. Oscar would therefore have been John’s brother. 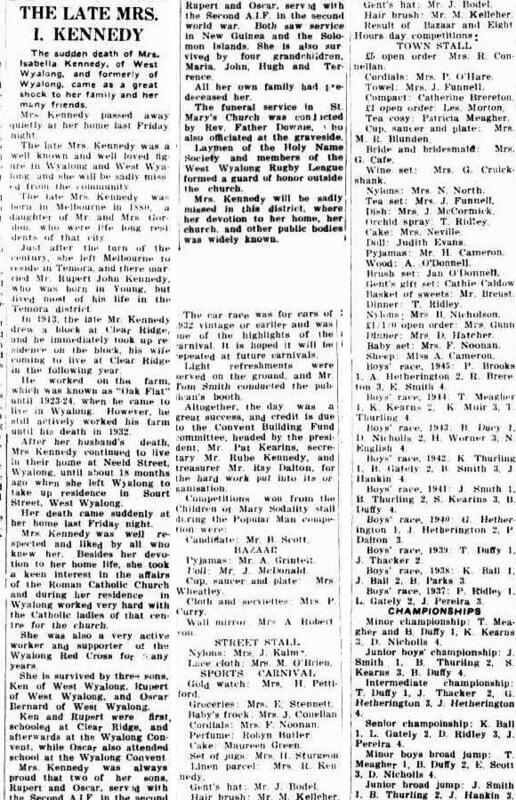 Since John was living at West Wyalong at the time of his death, I then did a search for an Isabella Kennedy who also died at West Wyalong. There were two records on Ancestry. Isabella Gordon, spinster, birthplace West Melbourne, occupation lady, age 39, residence Canterbury Vic, father Andrew Gordon, mother Bridget Dermody. John Rupert Kennedy was a bachelor, birthplace Young, NSW, occupation laborer, age 38, residence Wyalong, NSW, father John Robert Kennedy, laborer, mother Rosanna McManus. They were married 13 June 1919, at Our Lady of Victories, Camberwell, by George Johnson, a Catholic Priest. The witnesses were Patrick Peters and Maud Stewart. I also found Isabella’s obituary. Maude Ann born in 1874 at West Melbourne. She married Charles Stewart in 1892 and died in 1913 at Fitzroy South. Margaret born in 1878 at Melbourne. She married George Moonie in 1906, and died in 1920 at Heidelberg. Isabella born in 1880 at Melbourne. She married John Rupert Kennedy on the 13 June 1919 at Our Lady of Victories, Camberwell. Isabella died 3 October 1952 at West Wyalong, New South Wales. Martha born in 1884 at Melbourne. She married Leslie Chalmers in 1919, and died in 1923 at Melbourne East. Francis Farquhar born in 1886 at Melbourne. He died in 1886 at West Melbourne, at the age of 10 months.